Use recurring budgets to manage retainer projects or maintenance projects. Recurring budgets are created automatically. Used for retainers. A recurring budget is ongoing client work that occurs on a regular basis - weekly, monthly, annually, etc. A good example of a recurring budget would be monthly maintenance. This is something you and your client agreed on and you charge it regularly through a period of time. To make a budget recurring go the budget and select a Recurring tab. Select a recurring interval and the occurrence date. This is the date on which Productive will create a new recurring budget automatically. Pick the date when you wish the budget to stop ocurring or leave it blank if you want to make it occur indefinitely. If you need to make some changes in the budget click on the Edit recurring link, or Stop recurring completely. 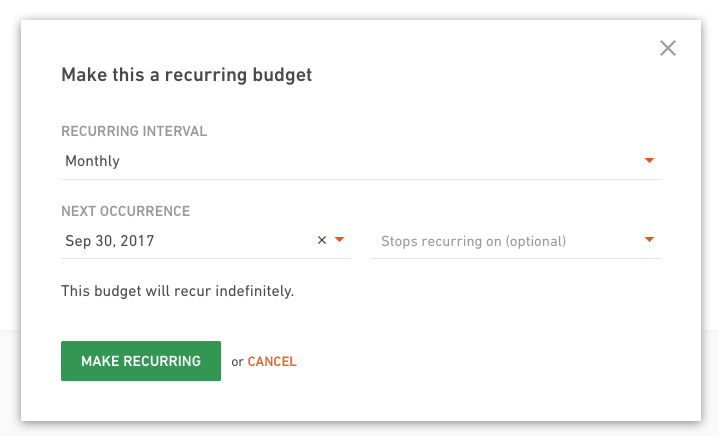 The list of all recurrences will be always shown in the Recurring tab.